In the MGF, the engine is mounted mid-ships and across the width of the car in an east-west configuration. When the car accelerates, the engine moves in the opposite direction to the rotation of the crankshaft- and as the engine mounts are made of flexible rubber to help isolate the passengers from the vibrations of the engine, this movement can be significant. If the exhaust system were entirely rigid, then the movement of the engine would put strain upon the exhaust pipe- both at the cylinder head at the exhaust manifold, and at the exhaust mounts at the silencer box. This would lead to fracture of the exhaust system or its mounts over a period of time- and ultimately breakage. To improve the longevity of the exhaust system, a flexible union is included to absorb the movement of the engine- the so called flexi-pipe. It is found located under the sump of the engine and is constructed of a corrugated steel 'flexible' segment, 'armoured' by a woven steel cover. Both components are subject to corrosion and metal fatigue. Both components are prone to damage from road debris or impact with 'traffic calming' measures. 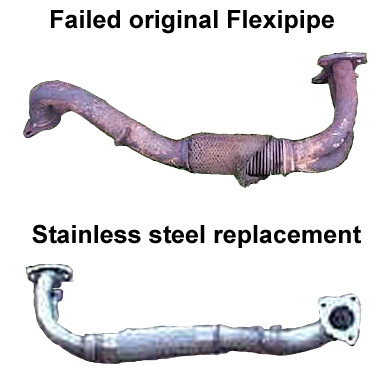 The result is premature failure of the flexi-pipe- and is often found to be an increasing problem on vehicles of 4-5 or more years of age. The only solution is replacement. There are three options for replacement currently available. First is replacement with an original equipment flexi-pipe from Rover, or a pattern replacement. The second option is to replace the pipe with a stainless steel 'pipe that is available from Mike Satur: this solves the corrosion component of the failure of the 'pipe, but not the work fatigue of the material. The final solution is to replace the exhaust manifold system with a performance 4-2-1 or 4-1 system which do away with the flexi-pipe altogether. Of course, this means that the exhaust system is now entirely rigid- and those bending stresses will be transferred to other components of the exhaust system- be they the mounting flanges to the cylinder head, to the welds on the manifold or to the mounting brackets for the system itself. The best proven system is the Exhaust By Design (EBD) 4-2-1 which has many happy Elise customers. Failures have so far been very few. Plus the manifold has the advantage of liberating a few more lb.ft of torque and bhp of power- but with a disadvantage of being classed as a performance modification by insurance companies. So the choice is yours. Personally, I'd explore the performance possibilities of the EBD manifold- but the other options are, IMO, quite acceptable. Flexi-pipe passes under the engine sump, connecting the exhaust manifold to the catalyst. Damaged flexi-pipe (top) showing failure of the woven steel shield. One option is to replace it with a stainless steel item (pictured, bottom).